The current Richland County Courthouse is the fourth courthouse to be erected in Olney, the county seat. The previous courthouse was destroyed by fire in 1913. 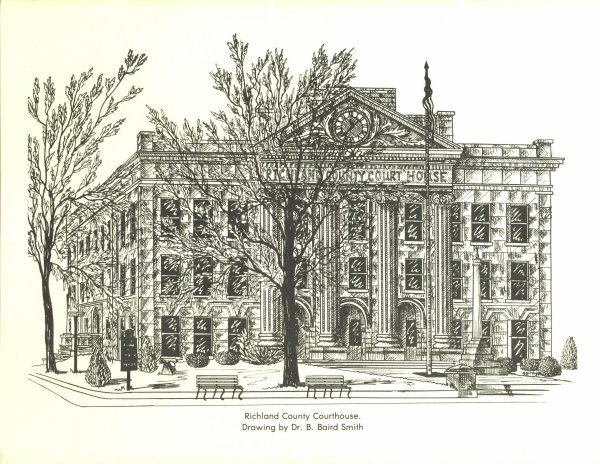 This drawing of the courthouse was done by Dr. B. Baird Smith and is reproduced here with permission of the Richland County Genealogical & Historical Society. YOUR HELP IS NEEDED. Do you have any Richland County court records to contribute?